Some people use their blenders every day. Some people use their blenders once in a while when they're hankering for a smoothy or a recipe calls for it. Whatever kind of blender user you are, you probably run into a couple of the same problems: stuff gets stuck at the top of the blender and won't fall down into the blades, and blenders are hard to clean. 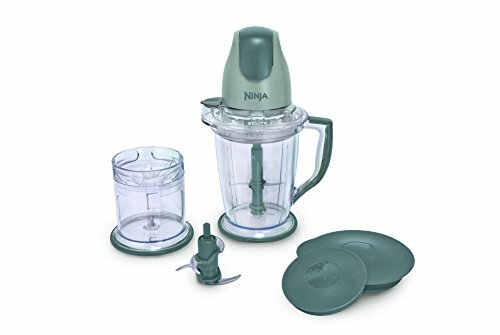 The Ninja Master Prep Blender solves these problems but not without introducing a few problems of its own. This blender is shaped a bit differently than most conventional blenders. Its side walls are more vertical rather than the V-shape that you usually see on a blender. Also, it has two levels of blades. One is about a half-inch above the bottom and the other is about two inches above the bottom. Because the side walls are mostly vertical, things can just slide down into the blades. The two-level blade system helps this process along by cutting up about a third of whatever you put into the blender before even needing the stuff on top to move. This results in a lot of the stuff in the bottom being compressed and making room for the stuff on top to fall down. I only sometimes have problems with stuff getting stuck in the top of this blender. But when that happens, I can usually fix it by just pulsing it a couple times or with a little jiggle. This blender breaks down into five pieces: the top, the top gasket, the pitcher, and the two blade spindles. This makes it really easy to clean. Everything comes apart without any tools at all. There is a little locking mechanism that holds the two blade spindles together when the blender is in operation, but that comes undone with an easy and unopposed quarter-twist. Once everything's all separated, you can rinse it out and wipe everything down quickly with a sponge. There are a few crevices in the lid that are a bit hard to clean, and the blade spindles have some nooks and crannies in them. But, it's way easier than trying to reach into a conventional blender and wipe down the blades that are semi-permanently attached to the base of a glass pitcher. While it's easy to clean, it's hard to keep completely clean. The pitcher is plastic, not glass, so it accumulates scratches very quickly, and those scratches are harder to clean than a smooth surface. After a while, the plastic becomes foggy instead of clear. I've found that this can be solved by putting a couple spoonfuls of baking soda into the blender, filling it with warm water, and letting it soak for an hour or so. Afterwards I scrub it with a sponge a little bit, and then it'll look mostly clear once it dries. Why did my spout cover break off? Well, I think it's designed to only open about 30 degrees. I assumed I could open it to 90 degrees and did so each time. Well, the pins on the spout cover that hold it into the lid are made of plastic, and they eventually broke from me continually opening the lid too far. This has turned out to not be that big of a problem for me. I just have to make sure to slowly pulse the blender up to speed and not fill it too fill. When I do that, I don't have any problems with things flying out of the blender when I use it. Of course, if I'm blending something with a lot of ice and water, I'll cover the spout with a paper towel to prevent the water from blasting out all over my kitchen when one of the blades inevitably knocks an ice cube into light speed. If you use your blender on a daily basis for smoothies or juices or whatever, I still recommend this blender in spite of its flaws. The cloudiness and the need to cover the spout with a paper towel when blending certain things are only minor inconveniences in my oppinion. They outweigh the major annoyances of having to carefully load a blender to avoid things getting stuck out of reach of the blades and having to reach deep inside a heavy glass container to try to carefully wipe clean some awkwardly placed blades.